It’s that time of year when a lot of folks are rushing out to the snowy mountains so they can get a few days of skiing and snowboarding in before all that beautiful white snow melts away. After all, you will not feel good about heading into spring if you did not spend at least one weekend in a nice cabin watching the snow fall down gently outside your window.
. They make for a very homely look, especially when matched with this next item. Candles add a touch of beauty to just about any situation. 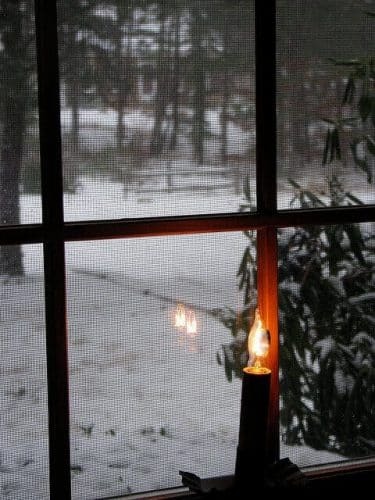 Just set an electric window candle on the window sill and wait for the sun to go down. I say use and electric candle as opposed to a regular one so that you don’t have to worry about safety hazards. Set up a couple rocking chairs. Let’s not forget about the most vital part – you. Sit down and enjoy the wonderful view through this crafty screen that was once just a plain boring window. To maximize the relaxation effect, cover yourself with a woven blanket and make sure you have a mug of hot cocoa in hand – as well as a companion by your side. Crafting is not just about projects, it’s about moments as well. Enjoy this moment that you have created; relax, converse, and then cry when the warm weather comes and melts this picturesque seen away.